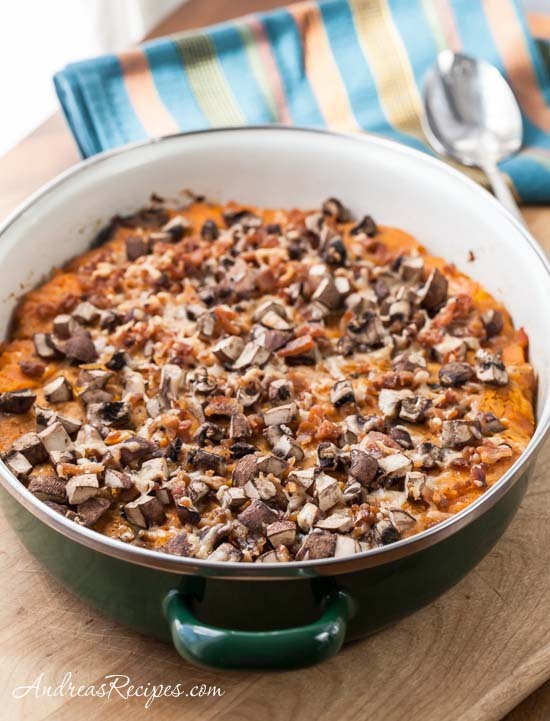 I think this post officially beats my record for the earliest Thanksgiving recipe, but I can’t help it; this butternut squash au gratin is just too good to wait until Turkey Day. Make it for Sunday dinner sometime with roasted chicken, turkey, or pork, and then again for Thanksgiving dinner. It’s definitely a keeper. The recipe is in the October issue of Cooking Light, a contribution from legendary Chef Alain Ducasse. Chef Ducasse uses chanterelle, shiitake, and oyster mushrooms in his dish, but I had to give up on those varieties after thoroughly searching four grocery stores—including my favorite international grocery store that usually has everything—and coming home empty-handed. So, I substituted white button and baby bella mushrooms, which worked well, they just give the dish a different flavor profile from the recommended mushrooms. If you can find chanterelle mushrooms, and if they fit in your budget, you must give them a try. 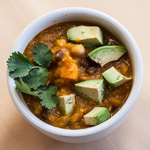 The flavor is incredible with butternut squash. I am a big fan of butternut squash dishes, so I knew that I would like it, but I was very pleasantly surprised that all of my guys liked it. The savory helped balance the natural sweetness of the squash, and it has just the right amount of cheese. And if you have any leftovers, it makes a nice breakfast or lunch. The recipe calls for finely diced butternut squash, so get your chopping arm ready. To save time on Thanksgiving day, you can chop the vegetables the day before and keep them tightly wrapped in the refrigerator until time to cook. Adapted from Cooking Light, contributed by Alain Ducasse. 1. Preheat the oven to 350°/175° C.
2. Warm the large nonstick skillet over medium-high heat. Add the olive oil and swirl to coat. Sauté the green onions for 30 seconds. Add 6 cups of the squash and sauté for 2 minutes. Reduce the heat to medium-low, and then stir in 1/4 teaspoon kosher salt. Cook, covered, until tender, about 15 minutes. Remove the lid and increase the heat to medium-high. Continue cooking until any liquid in the skillet evaporates, stirring frequently, about 2 more minutes. 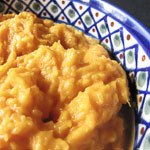 Transfer the squash mixture to the large bowl, and then mash with a potato masher or fork until smooth. Wipe the skillet clean. 3. Cook the bacon in the large nonstick skillet over medium-high heat just until crisp. Remove the bacon from the skillet, reserve the drippings, and crumble the bacon. Add the chanterelles, shiitakes, and sage to the skillet, and sauté until the mushrooms are browned, about 8 minutes. Add the beef stock and cook until the liquid almost evaporates, about 3 minutes. 4. 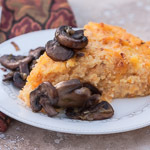 Transfer the mushroom mixture to the mashed squash, and add the remaining 2 cups diced squash, remaining 1/4 teaspoon salt, 1 ounce Parmigiano-­Reggiano cheese, ricotta cheese, and black pepper. Stir it all to combine. Spoon the squash mixture into the prepared baking dish. Cover with foil and bake in the preheated oven for 1 hour. Remove the pan from the oven and discard the foil. 4. Preheat the broiler to high. Sprinkle the crumbled bacon, remaining 1 ounce Parmigiano-Reggiano, and oyster mushrooms over the cooked squash. Broil until lightly browned, about 6 minutes. Remove from the oven and let stand 5 minutes before serving. I can’t even begin to tell you how wonderful this dish sounds! Although, I’ll definitely be trying this out at Thanksgiving, I may have to test it out myself sooner 😉 Fabulous recipe, thanks for sharing! !